“We would literally come in on the first business day of the month and spend the entire day pulling numbers, putting them into spreadsheets, and then we would have to get them done by 1 or 2 pm to send them over to Design, and then Design would have to get it back to us by 4 or 5 pm, at which point we would send out all of our emails. Welcome to our Agency Spotlight series, Kelsey. I have been dying to pick your brain for over a year now so I’m glad I finally have the chance to do so. First, for those who don’t know, could you just tell us a little about yourself and Blue Frog? Kelsey: Yeah, so Blue Frog Marketing is an inbound agency in Des Moines, Iowa. We service the US and Canada, so we are a little bit unique in that cost of living in Iowa is really low, and so our retainer prices can be low and yet we can service places like, we have clients in Boston and DC, and in LA where they would not be able to get that kind of service at that cost, so it’s very interesting. So, in addition to that, we are a website design – growth of the design and inbound marketing agency, so everything we’re involved is around websites. In fact, we don’t even take it but clients without producing the website because we have just seen so many websites go wrong, right? Got it, and so what are you doing specifically at Blue Frog? So, I am the director of client experience, so what that means, I started with the company four years ago as a strategist, so I was an account manager and had a little bit to do with sales and retention, and my retention rate was really behind. I average like 97% retention rate, I have lost one client so far in my career at Blue Frog, and so with that development, I’ve been able to train the new strategist, and then get them into the pattern that I used in building rapport and understanding data and explaining to the client, and teaching them in order to build those bonds and keep them long-term, and because of that growth that’s in the company, I’m now the person that, for lack of a better word, is an ally to the client. Have the best interest of the client is not ever because we never did have the best interest, we always have, but as we grow, we find that the messaging – the messaging is farther away from the core of the business as any company grows, and so we need that ally there to say, “This is what we stand for, this is what we can do for you,” even if that might not be the way that they interpreted in from another staff member. So, that’s where I come in. I’m kind of a conduit between them and management. 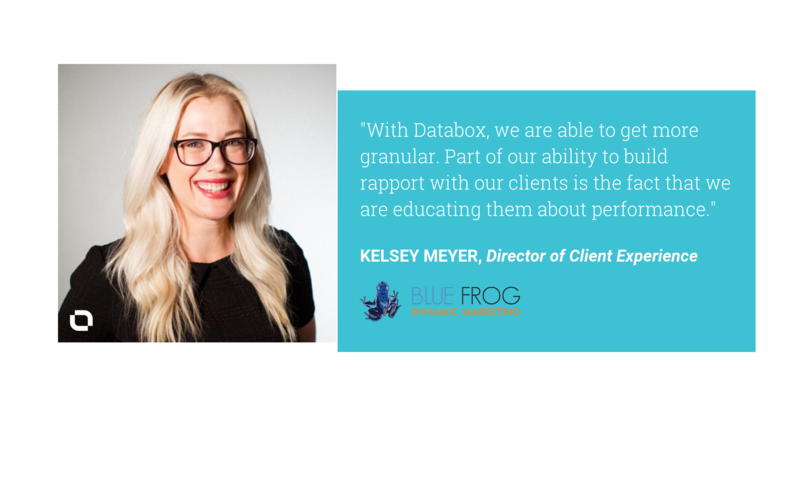 What was Blue Frog doing in terms of data analysis and client reporting before using Databox? So, everything that we have always done has revolved around goals, and those goals are really more business goals than data goals, and it’s still the way that we do it today, but today, we are able to back up what we are doing with data, with KPIs. So, back four years ago when we originally got into this, we would develop a goal like your business needs more leads, your business needs to be found on Google, that kind of thing, and then we would set in place a series of tasks to get us there, and then those tasks could be measured that you use to monitor rank, right? They don’t anymore. We used to monitor rank on Google, we used to monitor keyword success which doesn’t exist anymore, we would monitor organic traffic which of course, we still can, but it was very vague; we didn’t have the ability to put KPIs, assign KPIs to the tactics that we were doing, if that makes sense, and so our reporting, we would literally come in on the first business day of the month and spend the entire day pulling numbers, putting them into spreadsheets, and then we would have to get them done by like, one or two in the afternoon, and then send them to Design, and then Design would have to get it back by like, four or five in the afternoon, and then we would send out all of our emails. It was a mess, it was very, very stressful. I mean, we were pulling numbers from Facebook, from Google, Google Analytics, Google AdWords, and then HubSpot, and sometimes, SharpSpring, and sometimes, any other obscure program that we were using, and it was terrible and it was not efficient, and there were errors because we would find the number, and then we put it in a spreadsheet, right? Error data entry, and it would literally take up our entire day, and then end up sometimes not even being right. So, that is what our old reports day used to look like. You mentioned that there were some instances of manual error or there are a lot of different people that were involved, Did you ever find that the time it took to do these reports, were there members of your team that are like, “I can’t do this, I need to be doing something else”? Was there any sort of leeway that something else is going to take priority or was reporting the number one priority on the first business day of the month no matter what? No matter what. I mean, you cannot take a vacation, you could not take a day off. I mean, if you were sick, there is obviously a way that we could work around it, but honestly, in my memory, can’t think of a single time someone went sick on a reports day, and we didn’t take client meetings on the first of the month, we didn’t take client meetings of the first week of the month because if there was any spillover, if there was a problem, there was anything we needed to solve, yeah, I mean, the biggest thing is like, you just couldn’t and at the time, our business was smaller. Our department now is five people – the strategy, the people who are reporting, and then in addition to that, we do have our and department which is another three people. Back when we were doing it this way, there was two of us. So, we’ve just grown so much, but it was basically like this is reports day and you have to do it. Right, and I remember our first conversation, you guys were in there in your pajamas with your dogs, trying to make it as enjoyable as possible which was why initially, I was like, they are the best. I love that. Yes. Now, we still do those things but it’s more of a holiday. Since you’ve been using Databox, what has changed in terms of data analysis and client reporting for Blue Frog? We are just really able to get more granular. I mean, we have a lot of clients. Part of our ability to build rapport with our client is the fact that we are educating them about metrics. Business owners are not analysts; they are just not, and that’s why they are business owners, they are entrepreneurs, they don’t want to be told what to do and they don’t want to be told what to learn, in all honesty, and so, we find that some of our clients, we need a really, really general forward and we are able to give them a couple of pieces of information, and that we have others that allow us to get really granular. I know you’ve helped me with some of those types of clients specifically, and the day itself is not nearly as difficult. It sounds like you really are using Databox to have a more driven conversations with your clients, making sure that you are showing yes, these are the business goals and here’s how we are proving that these are valuable, or here’s how we are proving that we’re doing it or why we need to start doing it a little bit more intensively. So, are all of the strategists on your team going about using the reports with the same approach? We have a type of structure that we move clients through. So, we have kind of a what to expect in year one, what to expect in year two, what to expect in year three that most of our inbound clients follow. For example, even if you come to us in year one and you say, “Lead generation is my number one issue,” we are still going to try to get you found on Google. So, in year one, we might still be teaching you how to understand the sources of your traffic, and then by year two – so, the data board that we put together in the original year, in the very initial year, is almost always going to be fully about sources, both traffic sources and lead sources, and then as we of all that client into year two where we are looking at lead gen and about the super big focus for us and we need to say, our bounce rate is too high on this page and this is our most viewed page, therefore, we need to change this and that. We are able to show them proof of why we are doing that, and so to answer the original question, we do have a sort of template that we start all of our clients on, and then as they are understanding evolves, we move them down the path. When you are sharing and communicating results with either your team or with your clients, how do those conversations go? Are there any clients that you just give the reports to ordo you have a system in place for making sure they understand this data that you are presenting to them? I would like to have a better system, but really, the only way that we can tell them they understand if we can read them when we are meeting with them, and we service the US and Canada, so sometimes, it’s a phone call and you just have to be attuned to their voice and you have to kind of understand the relationship. We have some clients that we simply send the report to and that is that, especially our advertising clients because we send it weekly for at and that we are also able to update them on what we are manipulating over the course of the month. So, the ads is a little bit different; they don’t get a monthly meeting, but we do have some inbound clients. We have one particular inbound client that comes to mind. She just doesn’t meet with me. She trusts what we are doing, we’ve been working with her for five years. I also have clients that I meet with every single month and they still don’t understand what I mean by organic and I have to, every time I say organic, I also have to say, that’s traffic from Google, Yahoo!, and Bing. It’s every single day. It’s one word at this point. Does the entire team use Databox? Yeah. Most of our specialists do use Databox, specifically our ads team uses it, and they do use it on a client-facing level, and then our web team uses it on an internal level that’s not client-facing at all, we use it for our growth driven design, and so that there and we have an analyst who is on the backend. That is Michaela, she was promoted to be an analyst. She’s using it on the backend now, and she’s no longer going to be client-facing like that, and she started – for those of you who don’t know the team, she started as a strategist, but the strategists are the client-facing account managers, so they are a generalist, in a way. They have to understand everything, and then those specialists, they are trained on Databox so that they can utilize Databox to tell us the generalists what we need to know when we are having conversations with the client in addition to our knowledge that we are just required to know. So, yeah, it’s absolutely something that we use in our internal training and in our internal communication. As an agency that has done a lot of things very well, what do you find to be the biggest value add of being a Databox partner? I mean, I would say this to anyone from Databox who talks to me about our ability to have access to you anytime is a really, really exceptional, and I wish I could call your boss and just tell him that sincerely, but also, I think it was really, really smart of them to have a person like you because tech companies, they don’t communicate well historically in my experience. But you know the ins and outs of everything, you have every answer and if you don’t have the answer, you will going to will find it, and that is the biggest value add for me because I am so busy and I have so many clients asking me questions, I have John, the owner of Blue Frog asking me questions, I’ve got my team members, I’m doing training, I’m showing everybody that sometimes, I just don’t have the time to figure it out myself, and I have an ally in you to go in be able to go in get that information, and that is priceless to me. Wow, thank you. That was so nice and it sounds like that’s exactly what you are to the clients at Blue Frog, so it’s probably why we get along. So, now, at this point, everyone knows that I’m a huge fan of Blue Frog, so where can people go to learn more about your agency? Our website. You’re going to find a huge culture-driven site design and come and learn about us. We are completely data-driven, we do everything in a realm of respect and accountability, and transparency, and if anyone is looking for an inbound partner, we would be happy to do it. So come visit us at www.bluefrogDM.com. Victoria Sher Tory is responsible for the well-being of our agency partners. She is the main point of contact throughout the entire process, providing insights into how to leverage the software through one-on-one calls and regular group webinars.